This entry was posted in comics, Homepage, Photo Fridays and tagged Photo Fridays. Bookmark the permalink. I just had a bear on my deck, standing up and leaning against the screen door. Air separated us! I walked toward him to shoo him away and he came down onto all fours, turning to go. This deck is up a flight and as he turned to go down, he looked at me and paused. Honestly he had the eyes of a dog begging for scraps. He was in no hurry to go. As I turned to walk away he came back toward the door. So much for letting the breeze in on a beautiful day. Thanks for sharing. It was a really good idea to introduce the characters to the reader, rather than make us figure it out, which we could have, but this was better. 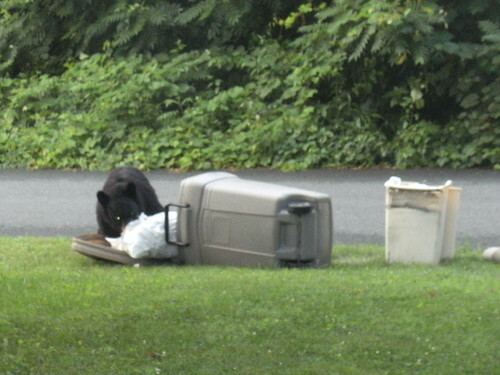 BTW – the bear picture is pretty amazing so now I just have to go read your slice of life story! I love the photo, Kevin! I’ll say again that I don’t think I could have been as calm as you and your wife were when you saw this ‘little’ guy mucking about in your trash!